This site contains primarily photographs of my travels since 1958 in the Western States, Alaska and Canada. 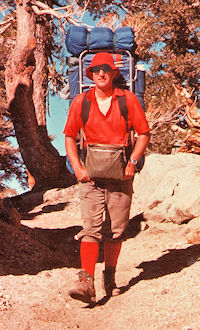 Between 1958 and 1995 I did extensive backpacking and climbing, mostly in the Sierra Nevada of California. I have a large collection of pictures from these trips. In 1996, 1997 and 1998 I took three summer long trips during which I concentrated on the mountain and wilderness areas where I traveled, taking many pictures along the way. This site is organized into two main sections. One section consists of the diaries from each of my long summer trips, illustrated with some of my pictures. The other section consists of sets of pictures or slide shows illustrating various locations I have visited during this entire forty year period. These shows are organized by State and location and include reference information and links to other sites related to each location. I hope you will enjoy the pictures and find the informational material interesting and perhaps useful in planning your own trips. This site is continuously under construction as I add new sections to the slide shows. Please visit the About This Site page to learn more information about me and this site. The Links page leads to many useful information sites and to the other websites that I maintain for friends and for non-profit organizations. Please let me know by if you have any comments or questions, or if you have any problems viewing these pages.